← Boston Expo and Easter. On the Tuesday, after my DNF at Boston I began looking for a redemption race. I was trained and had worked hard, I wanted number 5. 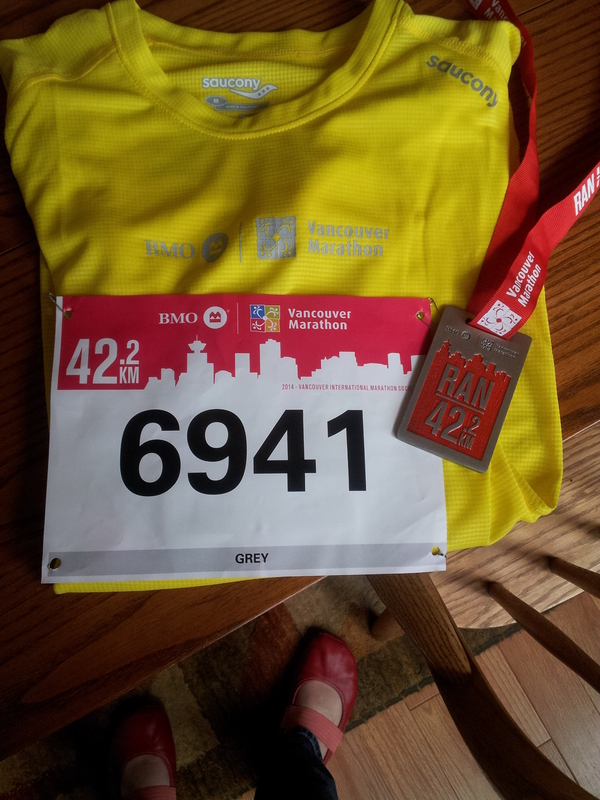 The options were the BMO Vancouver Marathon, which was sold out, and the Tacoma City Marathon, which I could register for the day before the race. Both are hilly and the weather can go either way in both locations. I had heard how beautiful Vancouver is, but I haven’t been there. I filled out the waitlist application for Vancouver and made a phone call to explain my sad Boston story. Within a day I had a waitlist code and was registered. My friends Marilyn and Travis let me travel up with them and share their room. THANK YOU guys! It was much more fun than going on my own. They had registered months ago for the race. We left on Saturday morning about 9 am. Travis’s mother Vickie also came as the support team. 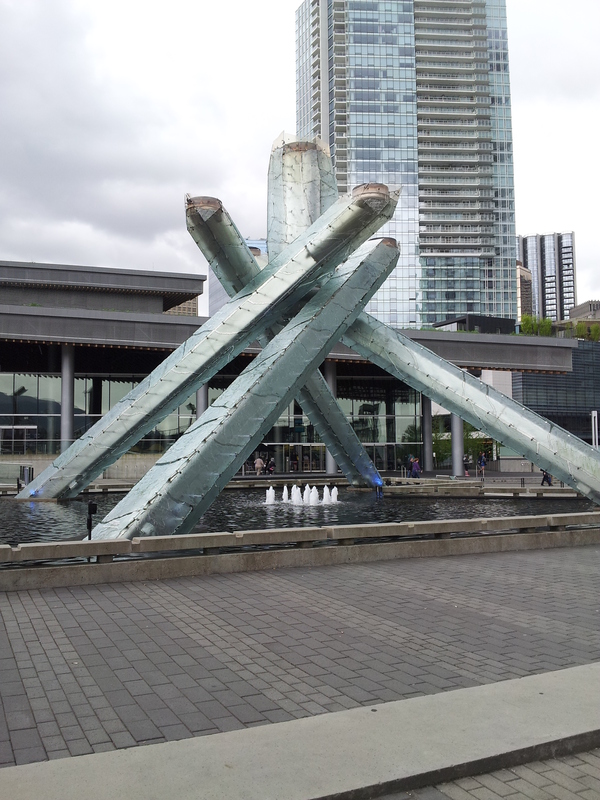 We had lunch at the Cactus Club Café, then we went to the Expo to pick up our bibs. The Expo was small but had all the basics. We had a great dinner at the Italian Kitchen. Sorry no food pictures this post. I woke up feeling good and not throwing up! We left the hotel about 7 and took the TransLink to Queen Elizabeth Park where the race started at 8:30. It was raining all day and about 50 degrees, so it felt cold. Plenty of Porta Potties. The race started on time, O Canada and the first coral was off. I started about 15 minutes later. I made the rookie mistake of going out too fast, for the first 15 miles. I kept telling myself to back off, but my legs didn’t listen. It was cold, windy and very wet the whole race. This is a hilly course, but the last miles are flat. It was not fun and the “beautiful” course I thought I would see was gray, wet and fogged in. I finished in 4:35:51. It is my second fastest marathon. And after my mess in Boston I was so happy to have number 5 in the books. With only 5,000 marathoner’s the finish chute was quick. 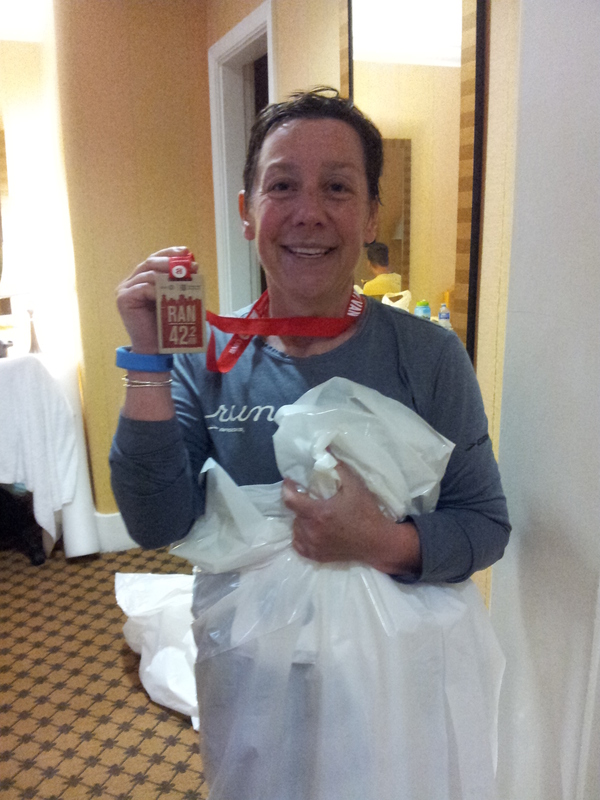 I got my medal, plastic wrap, water, banana and food box quickly. I did stop to have my picture taken. I could see the hotel at the end of the finisher chute. it wasn’t even a block away. This has been my toughest recovery after a marathon. I don’t know if it was the hills, because NYC had a bigger elevation gain. I think it was the cold rain and never warming up the whole race. I will be taking a break from running this week. Marathon training for Chicago starts in June! 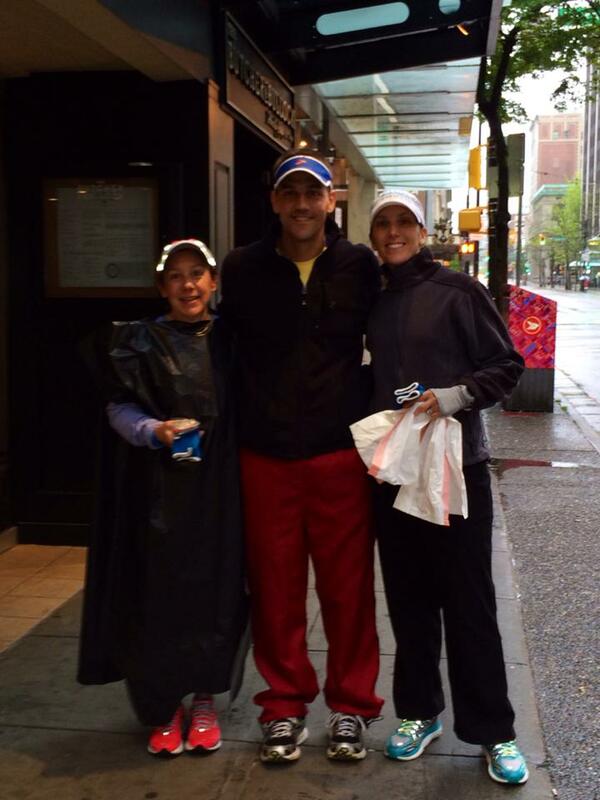 This entry was posted in Uncategorized and tagged BMO Vancouver Marathon, marathons, Running. Bookmark the permalink. 1 Response to Redemption Race!